Reflections of a Grady Doctor: Music Lyrics Monday: Comin' from where I'm from. 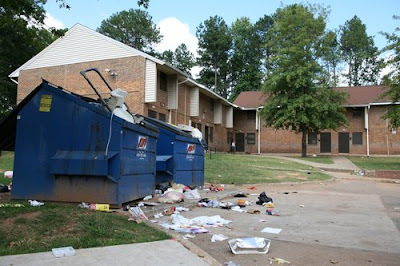 The now demolished "Grady Homes" public housing project, formerly around the corner from Grady Hospital. 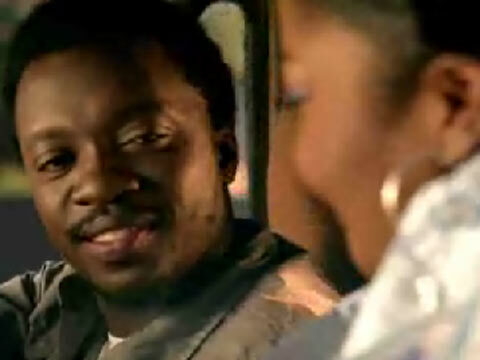 ~ Anthony Hamilton's "Comin' from where I'm from"
I love any song that tells a story. This one has always moved me because it begs and pleads for understanding and empathy. In the most soulful way, it eloquently explains generational failures and the dysfunctional aftermath of not having a strong foundation upon which to build. 'Cause a strong foundation is important -- as hell. I'm a black woman who was raised by two college educated parents that loved each other right in front of me. They cared what was on my report card and set very high expectations of me--ones that they, too, worked to live up to. I wasn't confused by their behaviors and they shielded my innocence until I was old enough to understand what it means to lose it. One of my parents also had parents and even a grandmother that had college degrees. My mother saw other continents as a child and had books read to her at night. Someone was tucking her in and telling her she was wonderful from 1947 until forever. Because when you hear that from very early on, it sticks with you forever. My father's parents didn't receive education beyond high school, but they loved each other very much. This means their eleven children got to see that. They, too, had expectations and told their son, my father, that he was "a cat that just ain't got no kittens yet" -- which was a praise meaning that he was responsible, dependable, and full of promise. Which he grew up believing. And then paying forward to his own kids. See, coming from where I'm from? I had something to work with. My parents saw their four children achieve not only bachelor's degrees with honors, they also saw those same kids getting conferred terminal degrees. Two of whom finished law school, one of whom earned a doctorate in veterinary medicine, and another who completed an M.D. Sounds good, right? But see, when you're coming from where I'm from, becoming a physician wasn't a far stretch. It wasn't. And having a remote clue how to give and receive love wasn't like learning some foreign language. Because coming from where I'm from, that's what I was groomed for. To think well of myself and to believe I was worth something. I know that my foundation was solid, unwavering. I also know that this made it less hard for me than some others to build my house upon a hill. Every single day at Grady Hospital, I think of this in some way. I hear stories. I meet people. Then I think of where my patients are coming from -- which is rarely where me or any of their doctors are coming from. I hear these lyrics penned by this artist that you may have never even heard of playing on my mental iPod. I feel the vibrato of his haunting voice -- the authentic voice of someone who grew up in poverty in the Southern United States -- and it speaks to so many questions. Like, why would you have ever even tried that drug? After what you saw it do to so many people around you? What were you thinking when you did whatever-it-was-that-is-now-ruining-your-life? "My soul was on empty. I was searching for something." Or--the hardest question to get past--why do you hate yourself so much? "Started when I was nine years old. Woke up, my daddy was gone." Yeah. Those lyrics are deep. 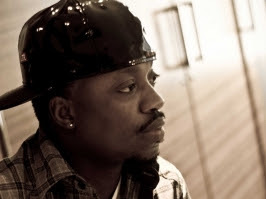 Even if someone reading this hasn't heard of Anthony Hamilton--I bet someone reading this has heard of the story he's telling because it sounds a little like their own. See, me? That's not my story. That's not where I'm from. So it's hard for me to fully know what that kind of abandonment feels like. You know, the kind of abandonment that makes children grow up to abandon themselves all over again? On November 6--tomorrow--a pivotal election will take place in the U.S. Sure, I've been fairly transparent about my political slant (which is quite liberal.) That doesn't mean that I don't have respect for the many, many folks out there who don't share my views. I happen to know that there are a lot of wonderful, caring, smart human beings with whom I've just agreed to disagree. But honestly? This time, I'm scared. Really scared. And perhaps I can say I'm nervous about some specific issues but mostly I'm just scared in a "big picture" sense. Scared of being led by people that don't strongly consider the complexity of what it's like to be comin' from where so many people are comin' from. Why not having a good job or a clean criminal record is sometimes about more than just being lazy or shiftless. And how when someone who woke up with a missing father and the 'hood as their main role model, that kind of foundation is as sorry as a soup sandwich. I'm afraid of anyone who doesn't recognize that when someone has a soul on empty it's hard to be a part of functional relationships, families and lives without some major interventions. The kinds of interventions that you have to put love into. My prayer is that whoever becomes president really, truly cares. Deep down in their soul, cares. Especially for "the least of these." The vulnerable ones who sometimes have to walk to work. Or even do a little dirt. Because they don't know what else to do. I just want a government that cares. Not so much about the people that come from places that they come from. . . . but for all of the others who don't. Comin' from where I'm from . . . Please listen. This story is a story I hear every single day. From your lips to God's ears. Please. There are so many citizens in this country who do not fit the Norman Rockwell portrait of the face of the nation. You are right, dear woman- we need, we DESERVE a leader who recognizes those people too. Because they are absolutely as much a part of this country as the ones who look like, uh, Country Club members. Is that really so much to ask? May we all make the right choice. Thanks, s always, for being here, Sister Moon. 1. I told someone just the other day that the thing that scares me most about this election is that we may end up with leadership that seems to lack compassion, empathy, understanding. Do they not understand that "there, but by the grace of God, go I?" That "what you do to the least of these you do unto me?" 2. 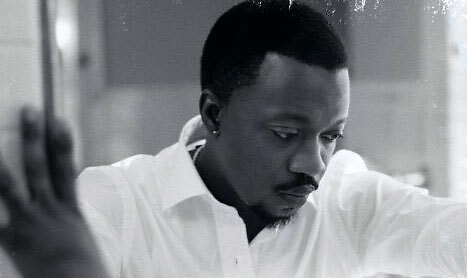 Seeing Anthony Hamilton in concert is on my list of "to-dos." I love that soulful little man! A lot of truth spittin goin' on around here!